Scottish Macaroon Bars are made from a surprising main ingredient: potatoes! Bet you wouldn’t have guessed that! 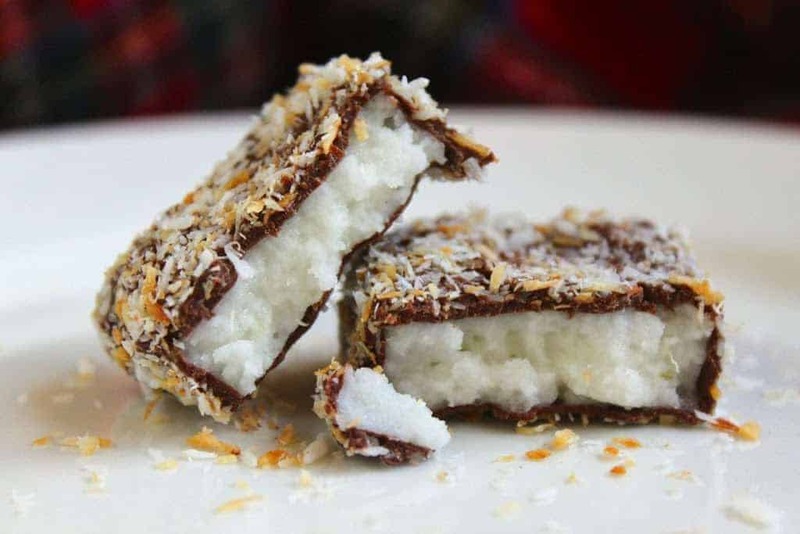 This treat is a quintessential Scottish sweet, especially loved by those who adore coconut. If you don’t already know that potatoes are one of my favorite foods, now you know. 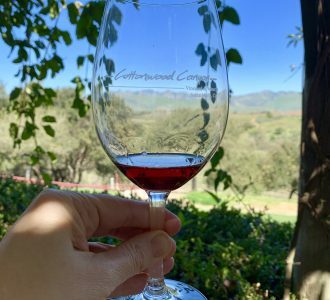 I have over 34 posts which either feature or include potatoes in one form or another, ranging from appetizers to soups to main dishes, and as of today, I can add candy to the list. 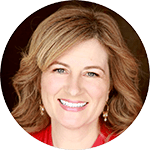 Potatoes are so incredibly versatile, and to highlight this fact, The Idaho Potato Commission sponsored an event called Potato Palooza where everything on the menu included potatoes. 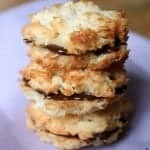 Although I didn’t need to bring anything to share, I couldn’t resist taking along a sweet I’ve been planning to post for a long time: Scottish Macaroons. It was perfect because they are made with potatoes! You’d never, ever guess that these sweets are made with potatoes even if you make them yourself; I’m still amazed each time I eat one. And did I mention that they’re gluten-free? 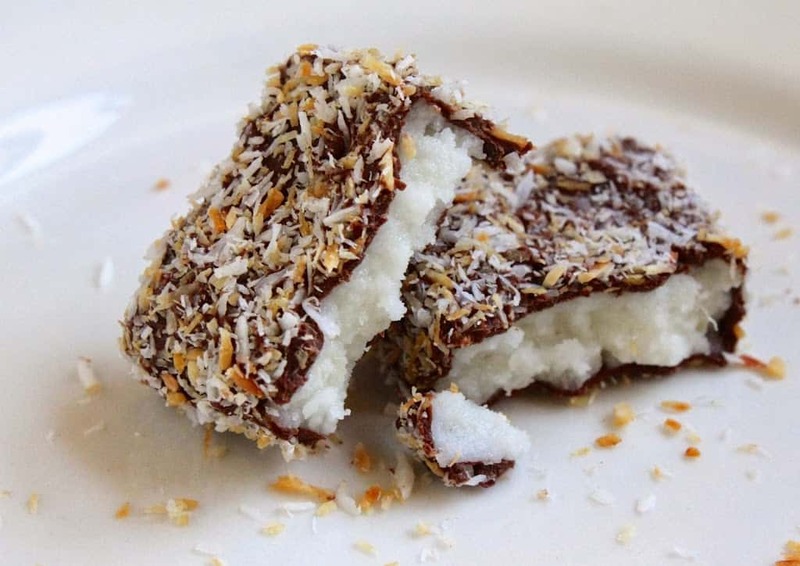 My Dad used to sell Scottish Macaroon Bars in his fish and chip shop in Scotland, and being a coconut lover since I can remember, they were a delightful treat. If you don’t have a sweet tooth, they might not be for you since they are very sweet, which is why I decided to make smaller versions of the ones on store shelves. After reading the ingredients (ugh) in the Lee’s brand macaroons, I am much happier to make my own with a few simple ingredients, including a potato! 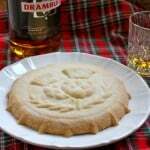 My recipe was featured in Scotland Now and was received with much excitement! 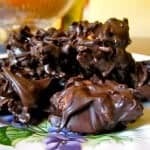 If you love chocolate and coconut, you will probably also love this recipe from my Aunt Virginia in Scotland! 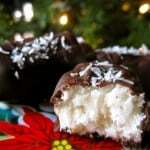 Homemade Bounty/Mounds bars! Boil the unpeeled potato until ready. Drain, peel and mash the potato and allow to cool completely. Begin adding some powdered sugar, about half a cup at a time. 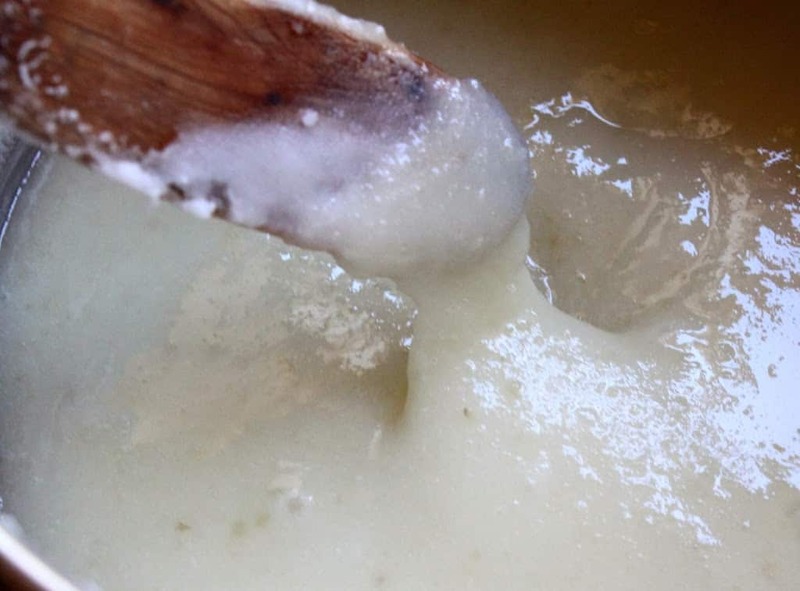 Don’t fret if the mixture becomes gooey, because it will. Just keep adding the sugar and mixing well, and soon it will have a fondant texture. Add enough sugar so that it comes together and is very stiff. 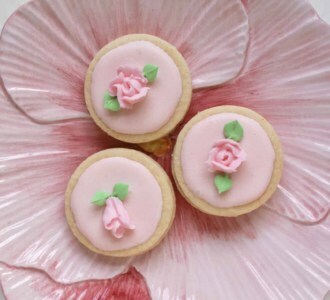 If you’d like to make a pink version (I made half the batch pink for Valentine’s Day) just add a drop of red food coloring. Prepare a cookie sheet (which will fit into your freezer) with waxed paper or a silicone liner. 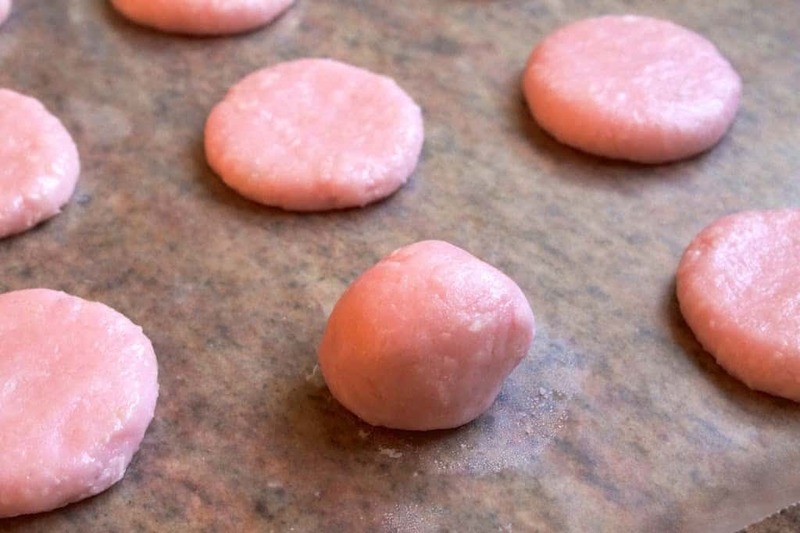 At this point, you can roll the macaroon mixture into small balls and flatten them, or for the traditional style, shape it into a rectangle on the sheet and then place in the freezer for about 4 hours or longer. 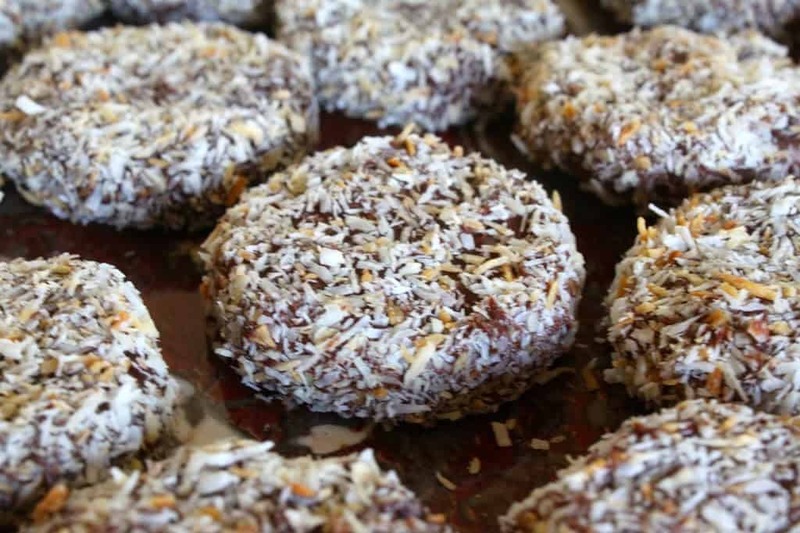 Prepare the coconut, by placing it on a cookie sheet in a preheated 300 ºF oven for 5 minutes. Stir the coconut and continue to monitor closely as it will turn brown very quickly. 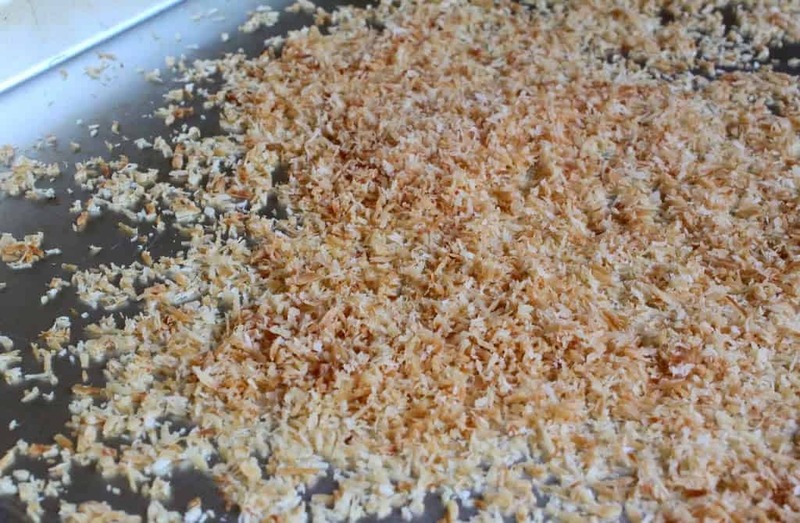 Remove from the oven when it’s a nice brown color; cool and mix with an equal amount of untoasted coconut. Place in a plate which will be a good size for dipping the macaroons. 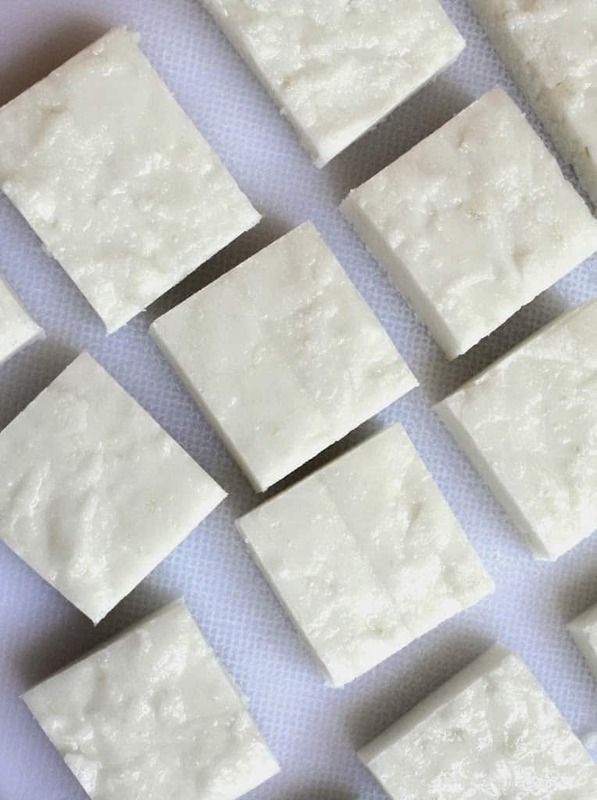 If you made a rectangle shape of macaroons, cut them into your preferred size and shape. 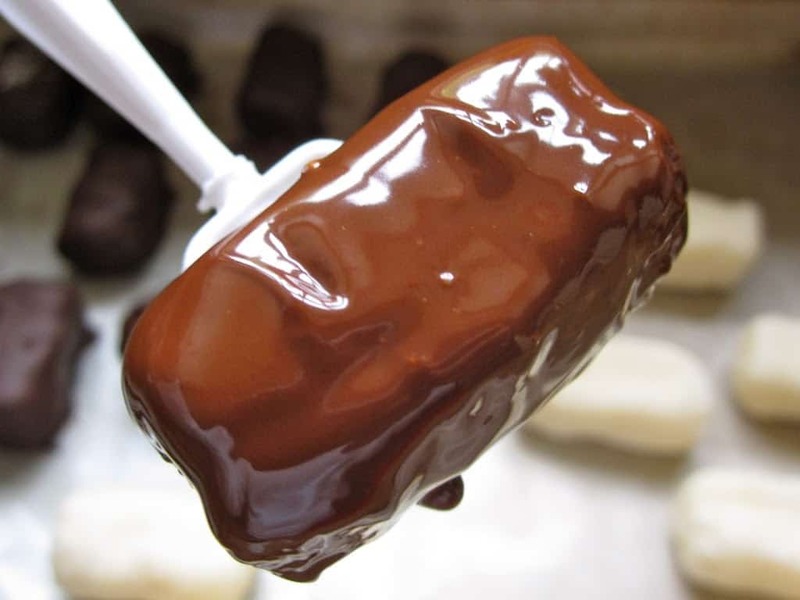 Keep in the freezer until ready to dip. When you are ready to finish the macaroons, melt the chocolate. Dip each piece into the chocolate, and immediately coat with the combination of shredded coconut. Place on a tray to set. I am using a two pronged candy fork. Once the chocolate has hardened, there is no need to freeze or refrigerate the Scottish Macaroon bars. (the last part shouldn’t be a problem)! 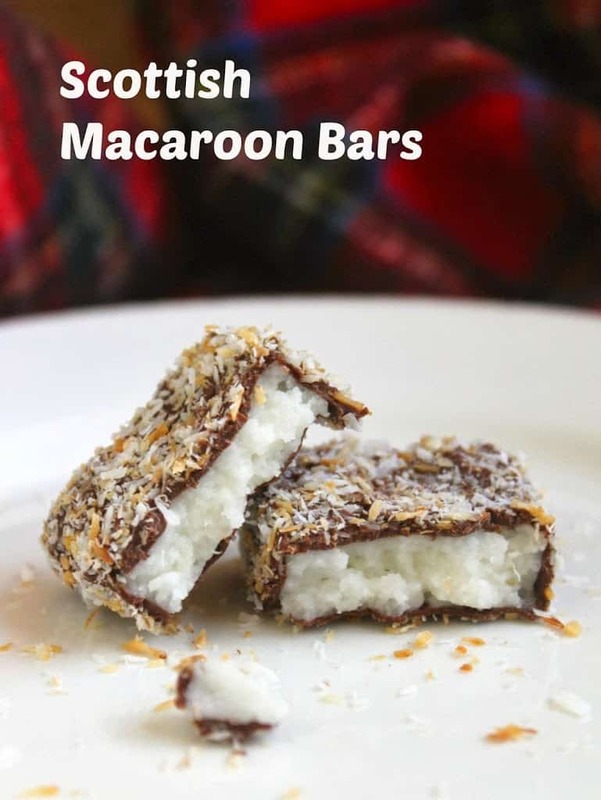 I hope you enjoyed my recipe for Scottish Macaroon Bars. A traditional Scottish sweet/candy made with potatoes. 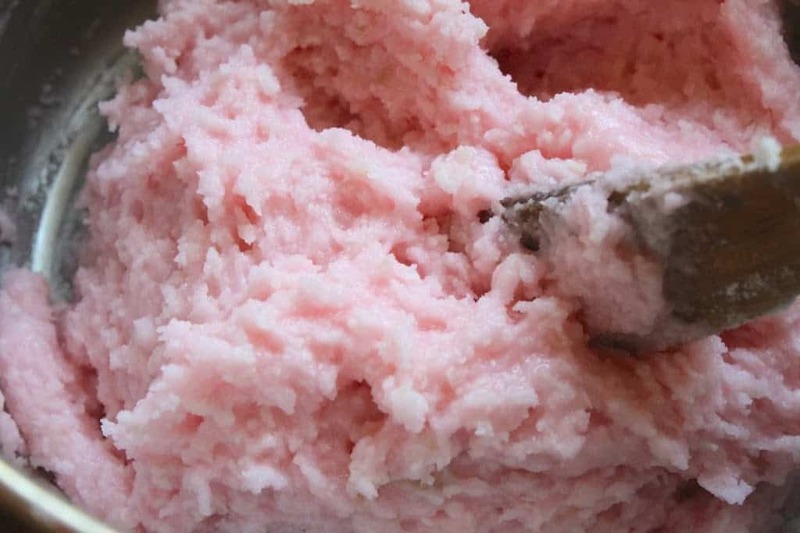 Place cooled mashed potato in a bowl and begin adding powdered sugar, a little at a time, Continue adding the sugar and mixing well, and soon it will have a fondant texture. Add enough sugar so that it comes together and is very stiff. Line a baking sheet (which will fit into your freezer) with greaseproof/wax paper or a silicone baking mat. Shape mixture into a rectangle on the sheet and place in the freezer for about 4 hours or longer. Prepare the coconut, by placing half of it on a baking sheet in a preheated (150ºC) 300 ºF oven for 5 minutes. Stir the coconut and continue to monitor closely as it will brown quickly. Remove from the oven when golden brown; cool and mix with the other half of untoasted coconut and transfer to a plate for dipping. Remove the macaroons from the freezer and cut into your preferred size and shape, but keep in the freezer until ready to dip. When you are ready to finish the macaroons, melt the chocolate. 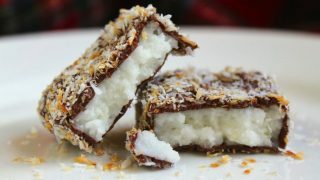 Dip each piece into the chocolate, and immediately coat with the combination of shredded coconut. Place on a tray to set. 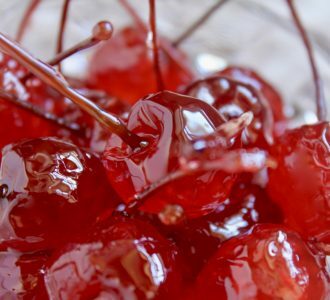 Keep in a cool, dry place, preferably in a tin, and consume within 7 to 10 days. Good ole southern tater candy with a twist. Really? I bet it was the Scottish immigrants who brought it over! Cool! Lovely to see more people are.making these delicious sweets. I’ve been making them for about 35 years. My mother made them before that. Always a favourite in the family. I’m trying to figure out how to have a thinner coating of chocolate….? 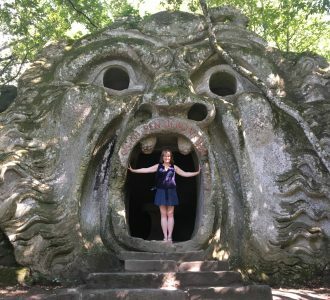 I know this is an older post, but I find this recipe fascinating. I grew up making delicious potato candy (basically potatoes, powdered sugar, and peanut butter) and thought using potatoes in candy was just some weird rural US thing. Now that I think about it, it makes sense that there would be other variations of potato candy out there too! Going to try this recipe today! 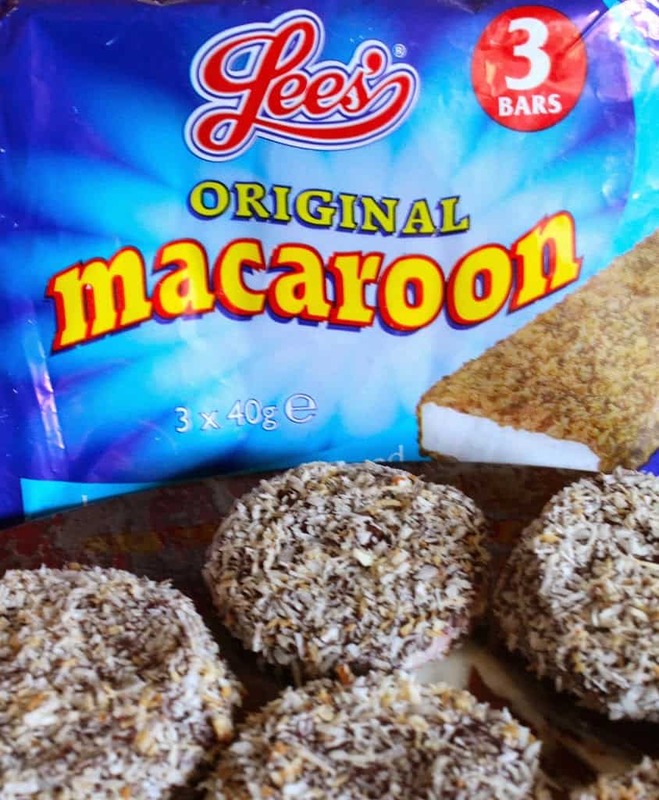 I found Lee’s Macaroon Bars for sale in a local shop in Wales this morning but it tasted awful and my Scottish mother told me they must have changed the recipe since she was a child because she used to love them. Fascinating about the potato.. I tried following recipe for Scottish Macaroons, but each time the centre is too soft. Are home made ones meant to be a little softer in middle, and if not, how do I harden the centre. 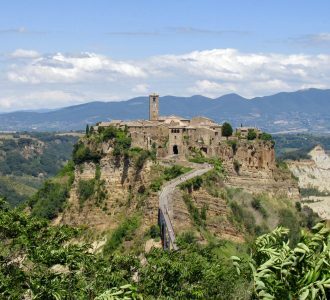 Read article about using TYLOSE, is this wise? Never knew about the potatoes. Will definitely try these, as I live in Norway will try and get a dry potato as we have different types here, only one familiar futon Scotland in Pimpernel. Thank you for such clear instructions. Thank you so much for this recipe, you may have made my Christmas! We’ve recently moved from Scotland and have had trouble finding these anywhere. All these years buying them and I had no idea they were so easy to make or contained potato, it’s so simple and great for kids to get involved too. Hi Ann Michelle, I haven’t actually. I don’t know of anyone who does, either! The Lee’s are still available, but they aren’t homemade. :) Good luck! These are fantastic! Dare I say, they look even better than the original that we grew up with in our lovely Scotland. I made them for the first time last Christmas and was surprised how my tastes had changed over the years as they were just so sweet and so I made mini snowball versions, like my Granny would have done. But seeing your pro photos of them, there’s nothing more nostalgic as seeing the good ol’ macaroon bar! Bravo. Ive mad these a couple of time, they are sooo good! Hi Suzanne! I’m so glad you like them, but I don’t think I would freeze them as when you take them out, they’ll probably sweat and may ruin the chocolate coating and who knows how the inside will do with freezing? They do last quite a while in tins and you don’t usually have the heat to deal with in Scotland. How far in advance do you want to make them? Those look so delicious! I love macaroons! I can’t wait to try yours! Congrats! Where I come from in Northern New England, these ( minus the coconut ) are called Needhams. For many years they were made and sold by a company in Lewiston Me. 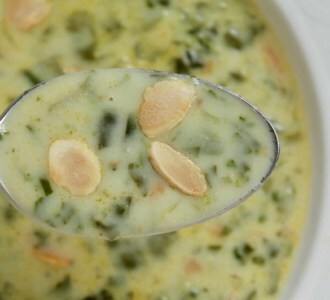 A wee variation on this recipe would be to add a few drops of peppermint essence with (optional) green food colouring. Can’t wait to try these – they are very like a Maine delight, here they call them Needhams :) I love using potatoes in sweet recipes – I have made cake with mashed potatoes! I just googled, “Needhams” and yes, they are so similar! Just coconut inside instead of outside! I’m sure I’d love those too. Wonder if they were made by a Scots immigrant a long time ago and the recipe changed over the years? My favorite use of potatoes are cinnamon rolls, so you your recipe doesn’t shock me… it entices me! I can’t wait to try this one. I was born in Northern England to a French mum and a dad with Spanish heritage and I live in Australia. I think I totally get you and your love of potatoes and macaroons. They look delish. Those macaroons were a perfect ending to a potato filled day. Thank you, Judy! You and Erika did a fabulous job putting on Potato Palooza! Using potatoes in such recipe is..surprising :) really intriguing :) The problem that I have after I moved to Australia- I can’t find good potatoes, they are just different here. Love them, reminds me of growing up. Your recipe sounds and looks amazing. 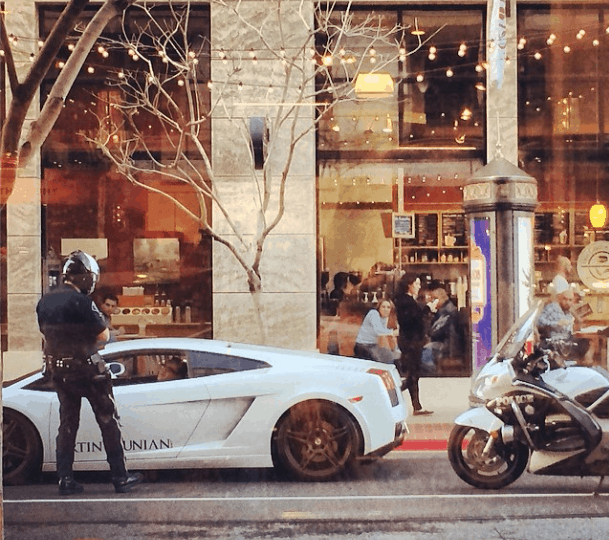 Regarding the life in L.A pic, I’ve been to car events with him, he gives Lamborghini owners a bad name.